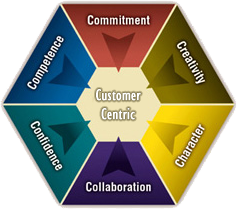 Sharon Drew Morgen » What is Customer-Centric? Lately I’ve been hearing the term Customer-Centric a lot. It was a big deal about 15 years ago when business finally recognized the importance of the buyer (I was going to title one of my books “I’d close more sales if it weren’t for the buyer” but decided not to when I realized folks really believed this!). But it’s having a resurgence. Why? Here are my guesses as to why the ‘new’ focus: because there is nowhere to hide anymore (errors get tweeted and blogged and commented); because buyers have all of the data that made sellers necessary and sellers are looking for a new way to promote themselves; because buyers have so many choices and now sellers will have a way to differentiate; because the allure of a great personality and relationship with one vendor is matched by all vendors and the next step is to make nice. When we become customer-centric merely to sell product, we are being manipulative…. not to mention missing the larger point. With all of the ‘customer-centricity’ I have a huge curiosity: why is it that the results for sales remain the same through time – approximately 7% across the board, regardless of industry or size of the sale or how well-defined their customer-centric activities? Maybe it’s because the sales effort doesn’t drive a sale close, and that the sales model is only useful during the final portion of the buying decision. After all, making customers the center of a sales method only serves to gather better data (hopefully) or build a better relationship. The problem isn’t that your solution or desire to be customer-centric is bad, or unnecessary. The problem is that the data and the relationship are secondary to what buyers need to manage internally, privately, and behind-the-scenes: First ensure that essential internal relationships and politics and rules are good-to-go with a purchase; Second make a solution/vendor choice. Every purchase that a buyer makes is a change management activity. It’s just not possible to add anything, even a necessary problem fix, to an existing system without the system experiencing negative repercussions. Sales doesn’t do change management, but does a fine job with needs analysis and solution placement. A new set of skills is necessary to lead folks through change management. Buyers have to do this anyway. It’s just not possible to ignore the system. Can you decide to move without handling issues involving schools, transportation, shopping, neighborhoods, banks, selling your own house, moving issues, calendar issues for kids, hours to the office – it’s not about the house. And a realtor generally doesn’t teach the buyer how to manage all of their internal decisions: How will you both know when one neighborhood will be best for your kids over another? What needs to happen for you to influence your bank manager to give you a larger mortgage given what happened to your payment schedules over the past year? Sales doesn’t handle this, as it’s off-line and not open to outsiders. But Buying Facilitation™ does. If you want to be truly customer-centric, make sales a one-two activity. First be a neutral navigator to your buyer – not to sell, but to have them peruse, recognize, manage, address, all of the internal systems issues they need to manage to get buy-in for change. To be truly customer-centric, add Buying Facilitation™. Start by focusing on the internal system that you understand so well (I understand the sales training system; you may understand the web design system, or the project management system.). Help the buyer recognize all that needs to happen before they’ll be ready to make a purchase. Get a hold of my newest book Dirty Little Secrets: why buyers can’t buy and sellers can’t sell and what you can do about it and it will explain all. Otherwise, spend some time reading some of my blog posts. The model is not sales, and requires a different mind set. But it’s learnable – and makes a huge difference in the timing of a sales cycle and differentiating from competition. Then, you’ll truly be serving your clients and be customer-centric from the first moment you connect – serving them in a way they truly need help. All good points on the reasons for return to a customer-centric focus. This relates well to the movement of Social CRM from Traditional CRM. I ask my clients, “Customers are changing – how are you relating to them?” Understanding you are in a relationship business is huge and the customer is the center point of why you stay in business.